Performers include: Timothy Bottoms, Jenny Drugan, Robert Gavin, Ed Gale, Danny Mann, Shannon Day, and Bobby Porter. They meet a beautiful “jungle girl” called Christa (Shannon Day) who’s grown up there since arriving there as a young girl from 1960’s San Francisco. The Porters also make friends with Stink (Bobby Porter), a young member of a monkey-like tribe called the Pakuni, and a baby dinosaur named Tasha (Ed Gale, voiced by Danny Mann). Causing trouble for the misplaced humans and their friends are a trio of exiled Sleestaks, a race of slow-moving but dangerous humanoid lizards. The criminal Sleestaks are Shung (Tom Allard), Keeg (Brian Williams), and Nim (R.C. Tass). Shung is the group’s leader and possesses a powerful crystal sword that has the power to control minds. 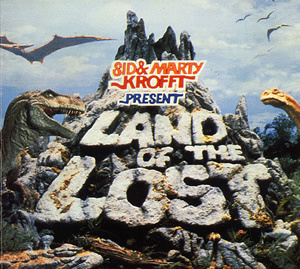 While trying to find a way home, the Porters and their friends must also avoid other hazards of the land, including a particularly angry one-eyed Tyrannosaurus, nicknamed Scarface, and other creatures. The series is a remake of the 1974 Saturday-morning show of the same name.